This is the first in a series of interviews I will be posting on my blog. Interview subjects will consist of top Art directors, Photo editors, Fashion editors and Ad agency creatives. The Interviews are conducted with an audience of pro-am photographers in mind and questions will relate almost exclusively to Photography and Photographers. Brendan and I have collaborated on a few projects together, namely last September's cover of GQ with Bollywood star Hrithik Roshan and the infamous Golden Golf Card shoot at the 2009 GQ Men of the Year Awards. He is currently the Art Director of Vogue India and a brand new dad. In this interview he shares what it takes to become a Vogue/GQ contributing photographer. Martin Prihoda: Good to have you on board Brendan, lets start of by ways of introduction. Can you give us a bit of your background in the publishing world? Brendan: Sure, I'm Australian by birth and started with FHM in Australia before moving to Russia. I had originally moved to Russia as part of the FHM team and wound up working for GQ there. After a few years with GQ Russia, I moved to Mumbai to launch GQ India and am currently the Art Director of Vogue India. M: I take it you like to travel, how have the transitions been? B: Well, I guess you could call India my second 'emerging market.' As an art director, its been really interesting learning the local aesthetic and expectations, that's one of the reasons I love to travel. In fact I had never been to either India or Russia before being posted there. M: For folks out there that might not know, what exactly does an 'Art Director' do? B: Basically I'm responsible for the visual layout of the magazine; from fonts, to photos used to the general layout of the magazine. Art directors can influence content somewhat but its generally the visual 'look and feel' of the magazine that we direct. M: How many photography portfolios do you see in a week? B: In India we probably average 3 a week but a lot of agencies abroad send through electronic PDF's and that sort of thing. As far as seeing people in the office, physically bringing in books its not very often, but like I said I get a lot of enquiries over email. Actually its becoming more so, photographers in India are beginning to realize that they have to start pitching against foreign photographers, that the work doesn't fall into place as easily as it used to. M: And would you say that's different in India than say the UK? B: I think its different because the market isn't as developed yet. There aren't, relatively speaking, as many photographers around. A larger, more established base of photographers exists in the UK and even in Russia. That being said, there's a wide range of talent that does contact us here, from people with almost no fashion experience wanting to shoot a fashion story to photographers who are very experienced and established in this market. M: Let's shift gears here a bit and talk specifics. What are some of the things you really look for when viewing a photographers portfolio? B: One of the first things I look for is consistency, particularly if its a photographer I haven't seen or worked with before. There's nothing worse than hiring a photographer based on a few shots in their portfolio and then the shoot becomes a disaster because they start shooting something completely different. An 'eye for detail' is key as is creativity, of course. One of the big things is use of light and lighting skill. India has some amazing light so I want to know that the photographer can capture and maximize that light. Its important to understand that the photographer is going to have a lot of input into how the shoot turns out so its not only portfolio but what are they like as a person. M: What are some of the things that turn you off when looking at a portfolio? B: (laughs) I don't like seeing too much work. You know, everyone has to edit down to their absolute best shots. If its 2010 now, I don't want to see shots from 2000. Also, I don't think its particularly effective to present a book that has a wide range of images; I think its best if photographers stick to a niche when presenting their work. Find out what you do well and stick to that, don't try to be everything to everyone. I think that's a big turn off actually, someone showing me fashion shots, then still life and then some book cover they shot. M: So if you’re looking at a fashion photographer's work, how many images are enough? B: I don’t know that you can put an exact number on it, whether its 16 images or 30 images...you have to keep someone intrigued in your work. I think its best to show your portfolio to a range of people, just to get some opinions before you submit, then edit them down. If there’s something there that’s a bit doubtful then take it out. M: Do you prefer when the photographer comes in or do you just not have the time to see that many people and prefer that they would email? B: I don’t mind either, it often works that we get an email pdf and then call the person in, just to understand their personality. What I can’t stand is people coming in with data stick/pan cards and asking to use your computer to show you their work. If you come in there needs to be a physical portfolio. M: My laptop crashed a few months back and I actually showed an editor my portfolio on my iTouch…she actually didn’t mind it. B: (laughs) yeah, that's fine, its when they come in with a laptop and the battery dies half way through or something doesn't open properly and they're fumbling around for ten minutes trying to get it to work...and believe me it happens. M: You’d think if you were going into Vogue or GQ to show your portfolio, you’d have your batteries charged...(laughter)…okay next question: when you’re on set, how involved do you like to be with the actual shoot? B: I guess I’m kind of an art director that hangs back a bit. I’ve hired the photographer based on my belief that they’re competent to do the job I’m after. Things that I’m looking for are more technical; if we’re doing a cover shoot than making sure there’s room for the masthead or knowing where the gutters (centerfold in a double page spread) are, that sort of thing. Of course we look at the shots and I may say something if its too dark or too light but I don’t like to get under the photographers feet too much; I mean if there’s something going on that I definitely don’t like then I’ll say something but I’m also wary until I actually get the shots back to the office and have a proper look at them. I’m not concerned about the nitty gritty small lighting details, that’s the photographers job and I trust the photographer with that. Generally you’ve hired the right person for the job so there’s no need for the art director to get too heavily involved. M: How important is the photographers attitude? B: Very Important. It comes down to making sure you’ve hired the right person for a particular job. Sometimes someone might give you attitude if they’re uncomfortable shooting what you’re wanting them to shoot, but that again that comes down to making sure you’re hiring the right person. The atmosphere on set has to be cordial, there’s a lot that depends on that especially if it’s a star, or a cover shoot…a lot hinges on it turning out right and you might have only two hours with someone and that’s two hours you’ll never get back again so everything has to work and work as smoothly as possible. M: Do some of your photographers still use film? B: God, I can’t remember the last time someone used film, maybe a few years ago there was a photographer that was still using medium format transparency. M: But you’d say that’s a rarity now? M: Are you finding that a lot of photographers are using DSLR’s on shoots or are they shooting Medium format digital. B: It’s a mixture of both. Probably 30% medium format 70% dSLR. For sure people are using dSLR’s more than say a digital back. M: Do find any major quality difference between the two? B: Not a great deal. I prefer medium format for sure, there is a quality difference there but its not down to the point where I would hire someone because of the equipment they were using. Its pretty close these days but there is something special about medium format. M: What are the major difference you see between the Indian and Western markets in relation to photography? B: That’s a tricky question, I think its more about the maturity of the market; you have to be more straight forward here in India, we can’t experiment as much…yet. Particularly because the magazines I’ve worked on are quite mainstream magazines; there’s not as much room for experimentation. That might be more of the nature of the magazine perhaps. M: So you think there’s more room for experimentation with different editions of Vogue abroad? M: So would you say the Indian culture is more of a conservative culture in that sense, re: experimentation? B: I wouldn’t necessarily say 'conservative' but while India Vogue hires international photographers, I think there’s still a certain level of education going on with the readers about certain 'foreign' styles of photography. For so long the style of photography in India has been quite similar and while the readership is getting there, I don’t think its quite where it is in the west, yet. While the market is maturing quite quickly there hasn’t been the same exposure to international fashion photographers of the caliber that Vogue hires in the west. M: How often do you shoot with International photographers? B: Vogue commissions an international photographer at least once a month. Sometimes they’ll shoot abroad in Thailand or Dubai, it depends. There’s a fashion team in London as well who do shoots there, probably every couple of months. M: What advice do you have for a young/beginning photographer who would like to start shooting for an international fashion magazine like Vogue India? B: Put together a strong portfolio, obviously. I think to shoot for Vogue you need to be able to show a great depth of experience, to be honest. But we have all kinds of stories, some are cover stories and some are smaller stories and we’re always keen to try new people for smaller stories and they’re usually chosen from a combination of enthusiasm and quality of work. We don’t have any strict prerequisites, if someone comes to me at the right time and I like their work you never know, there may be a project that’s ready for them at that moment; they needn’t have shot for 16 years and assisted this or that photographer, if their book suits the job then great. M: So someone could potentially walk in the door at the right time and be handed a job? B: Exactly. I mean the publishing market here is quite saturated. There’s a lot of titles with a relatively small talent pool of photographers, so we’re always happy to see new people. You know as I said it may not be for a cover story but it could something. M: Why do you think it’s a good time to be a photographer in India, right now? B: Purely because there’s more and more magazines launching and as I mentioned there’s really a relatively small talent pool of photographers and everyone’s shooting for everyone. Magazines are constantly on the lookout for someone new. M: Thanks for your time Brendan, it was great to hear your insights. B: Cheers and thanks for having me! 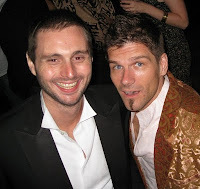 Brendan and Martin at the 2009 GQ India Men of the Year Awards, Mumbai. I hope people like you get more space to push the boundaries so that newer photographers like me get more leverage to experiment in the near future. Keep rocking. Great insight! I've been wanting to get into the Indian industry and this helps a lot! Thanks Martin! Wow, thanks for this wonderful interview. BY the way...what made you interview Brendan? Do you want to tell us that theres lot more than just taking good pictures?